I’ve had a fair amount of practice now, but I’m still a little wary of making pie crust. I’m getting good at the whole cutting-in-the-butter process, but rolling out pastry is still embarrassingly hard for me. Why is it so hard to roll things? It seems like a basic skill. Along with doing the laundry before completely running out of clean clothes, and remembering to put on sunscreen. I guess there are a few things I need to work on. 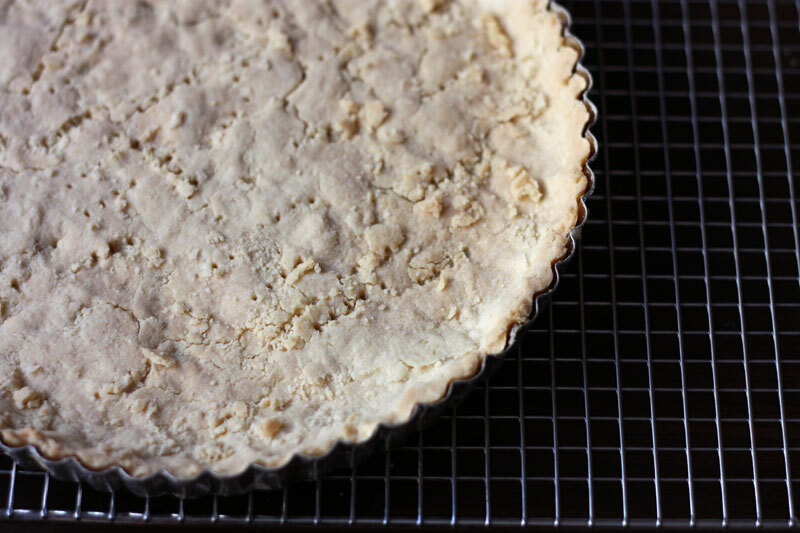 I gave myself a break with this tart – it uses a pat-in crust that is refreshingly simple. Even more refreshing is the filling: although my summers are usually a time for pies and crumbles and other things best served warm, it’s been unbearably hot and this tart has a stovetop filling, that sets in the fridge. Half the berries are cooked into a velvety base, and then fresh berries are folded in so that you still get tart berry explosions in every bite. It is very pretty before you cut into it, and then when you take a slice it kind of splodges everywhere. But no one minds, everything is splodgy once it’s in your tummy anyhow. Preheat oven to 350°F. Stir together flour, sugar, and salt. Using pastry blender or two knives, cut in butter until crumbly. Press dough together with fingers until it holds together. Press dough into 10-inch tart pan with removable bottom. Prick all over with fork. Bake in bottom third of oven until light golden, about 20 minutes. Let cool on rack. For the filling: In a saucepan, stir together sugar, cornstarch and salt. Whisk in water, 2 cups blueberries, lemon zest, and cinnamon. Bring to simmer over medium heat. Reduce heat and simmer gently, stirring often, until glossy and thickened (about 10 minutes). Remove from heat and stir in lemon juice and butter. Let cool slightly. Gently stir remaining berries into cooked berry mixture. Spoon into prepared crust and smooth top. Refrigerate for about 30 minutes, or until set. It looks quite similar to my cherry pie. Pat-in crush, interesting! 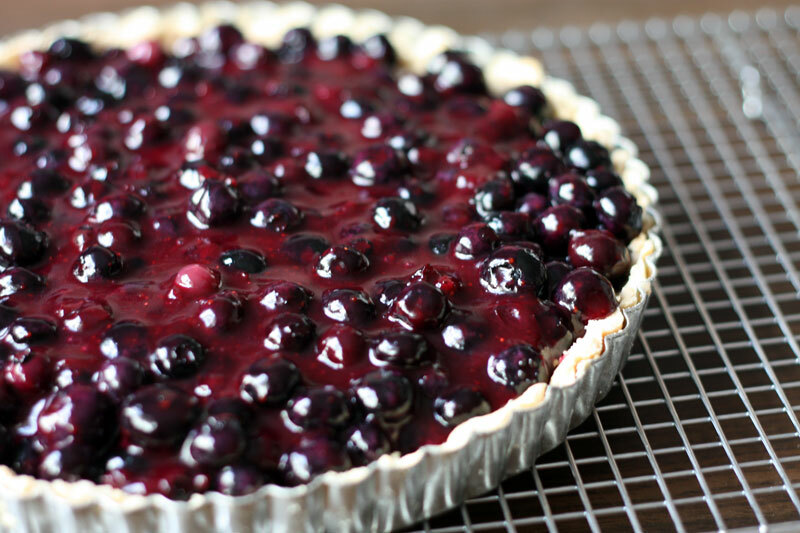 I’m loving all these blueberry recipes! Looks delicious! Your tart is beautiful! I love the deep purplish-blue hue of cooked blueberries. I hear you! Try as I may, I still can’t manage to roll out a decent pie crust, so pat in crusts are the best solution. How do you think this would turn out using tiny wild blueberries or a mix of berries instead of just the larger blues? siri – I love wild blueberries and I think this would probably work great with those as well. I would keep an eye on the filling as it cooks in case it changes the time required, but other than it should all be the same. If you try it, let us know how it goes! Ooooh yummo! I have been baking a cherry clafouti recently and trying to cover every available inch on the surface with cherries, looks a bit like this. I must try out this tart version. 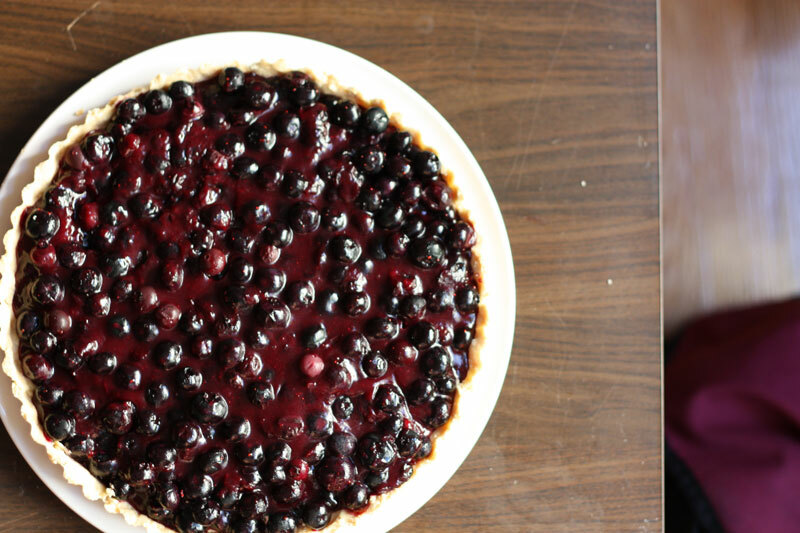 You are currently reading simple blueberry tart at one cake two cake.